Think about his dilemma. There are areas around Sunshine Coast and Brisbane which have special fire laws in place requiring special building considerations. If you are not aware of that fact you may buy land and then discover the cost of building your home just leaped thousands of dollars. Once you have an idea of your home plans and a few choices of building sites it is usually the perfect time to sit down with a builder and a company who provides drafting solutions. Show them your ideas and where you are interested in building. If you are working with Drafting Concepts they can help you quickly understand how the home you want to build might vary in cost dependent on your choice of property. This can aid you in the decision of which property to buy. The builder will have plenty of insights in this process, too. He has probably already built homes in the area and can tell you about any challenges which might come up. With this information you can make a better choice of what property to buy. 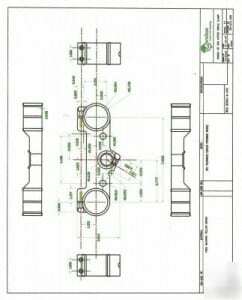 At that point you are ready to turn the project back over to the drafting solutions provider to start making the building construction drawing. 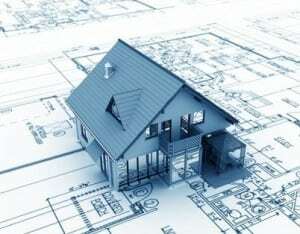 They will incorporate details which are important for your choice of property. If there are any uncertainties they will call the local councilor’s office, permit department, or visit with local inspectors to make sure all of the details are worked out. Do not be surprised to see someone from Drafting Concept show up at your building site even while figuring your free drafting quote. They may wish to walk over the property and make sure there are no other concerns which might be overlooked. Daryl Wood and his team are very detail oriented and always work to get every detail right the first time. 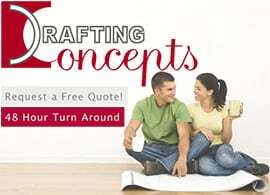 That is why they are so comfortable offering the option for 2 free changes on a drawing, get a free quote from Drafting Concepts and see how they treat you. You will be surprised how excited you will start feeling once you have the drafting quote in your hands and have chosen the property you wish to build on. You will be anxious to see the completed building construction drawing to help you envision the complete home. Drafting Concepts makes sure your wait is not very long. 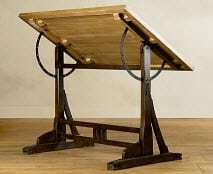 They complete drawings within ten days allowing you to start moving forward with your dreams quickly. 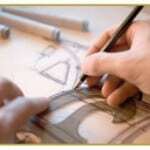 Be forewarned, the team at Drafting Concepts takes a deep interest in all of the projects using their drawings. They like to watch as the home is built. They want to hear about the home owners experience after they move into their new home. They are not in the drafting solutions business just as a career, but because they are passionate about helping people move into their dream homes. This passion is one of the biggest reasons they are meticulous about getting every detail right. They double check their drafting quote. They double check all of their figures on drawings. They want to see both the builder and home buyer smiling when those keys are finally handed over. 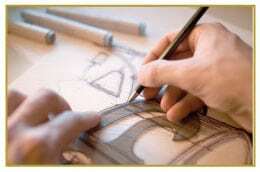 That is the real reward in their drafting solutions business.